Let’s face it. Piles of laundry and endless to-do lists are exhausting. They can actually mess with all aspects of your life—not just the obvious things such as trying to make your daily schedule work or the nagging notion that you really should have a neat home. At the end of the day, being organized is really all about having more time for yourself, and enabling you to live a more balanced life. According to a study in the Personality and Social Psychology Bulletin, women who described their homes as “cluttered” or full of “unfinished projects” were more depressed, fatigued, and had higher levels of the stress hormone cortisol than women who felt their homes were “restful” and “restorative.” This, as you might imagine, can take a toll on your mood, sleep, health, and more. And if you’re not feeling good about yourself and the space around you, it’s easy to see how that can create a negative environment that affects the family and friends around you. So what happens as clutter piles up? It stresses the brain, making you more likely to seek out things that make you feel better, such as comfort foods and overeating. It can also leave you exhausted and unable – or, more likely, unwilling – to get active and exercise. These negative effects have a way of compounding and adding to your metaphysical misery. For couples and families, clutter can create tension and conflict -- the time you spend looking for missing items can also take away from time you could be spending together. A messy home may also prevent you from inviting people over. Disorganization can lead to shame and embarrassment and actually create a physical and emotional boundary around you that prevents you from letting people in. So what’s the solution? A change in thought process. Clean the junk out of your head and your home with the help of journaling. Whether we realize it or not, the clutter we have in our homes is just a projection of what is going on inside our heads because we have not dealt with our internal clutter and just deal with the physical stuff on the outside. In other words, the way you set up and live in your home is really an external reflection of what’s going on internally. Once we deal with our internal clutter then we’re in a position to manage the external clutter in our living environment. As you start to de-stress, you’re better able to solicit help in decluttering to make your space more harmonious for you and your family. Journaling can help you explore ways to declutter your home and help your mind. 1. Write things down: things to do, birthdays, important events, shopping lists, places you need to be – write it all down in a central place so you’re not losing lists and looking for notes. 2. Create schedules and deadlines: stop panicking because you can’t remember when you need to be where. Organize your days, weeks, even months in a simple calendar or spreadsheet. Make that schedule easy to read and follow. Then relax. 3. Stop putting stuff off: the technical name for that is procrastination. But who cares? Stop doing it. Putting things off only adds to your to-do list and stress. 4. A place for everything and everything in its place: you may have heard that somewhere before, and it’s true. Put your keys, wallet, purse, and other important stuff in predetermined places and nowhere else. That way you won’t waste time and effort looking for things in places where they shouldn’t be. 5. 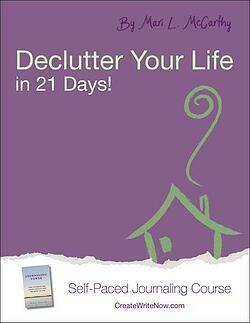 Declutter regularly: decluttering on a regular basis means you have less to do, just a little more often. But getting rid of one or two things every week is a whole lot easier than tackling a major clean-out once a year. 6. Keep only what you need: this doesn’t need further explanation. 7. Know where to get rid of things: discard, distribute, donate. Know ahead of time where certain things can go, such as donation and recycling centers so that you don’t have to agonize about what to do every time you get rid of something. 8. All bargains are not good: just because you can buy something doesn’t mean you should. Don’t be a hoarder. 9. Enlist others: as you embrace decluttering and organizing, enlist the help of others. 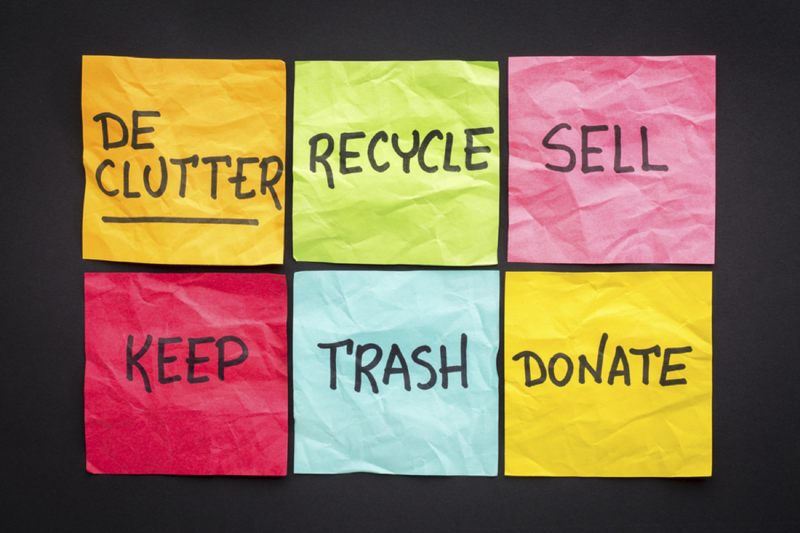 Get your partner or children to make their own decisions about what to toss or where to put something. Let them own the process, too. 10. Put a little effort into it: Organizing doesn’t come easy to some, so don’t be afraid to work hard at it. The rewards are tremendous. In our busy lives, it can be overwhelming to keep our living space structured and organized. As a result it becomes a source of stress that can creep into every nook and cranny of our lives. We tend to then not see the potential our home as a sanctuary or a retreat. And, at the end of the day, that’s exactly what it should be. Try journaling if you have not done so already because it will help you explore the issues that are driving the cluttering behavior. It’s time to reclaim your living space and in doing so, reclaim your life. If you want to learn ways to organize your living space for a happy and healthy home life while being a full time mom, please download the free eBook titled Avoiding the 24/7 Motherhood Struggle Through Journaling.